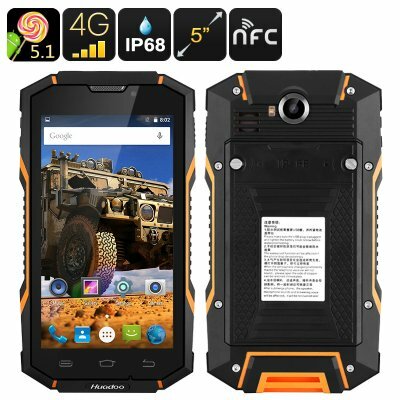 Successfully Added Huadoo HG06 Rugged Smartphone - IP68, Android OS, 2 IMEI, 4G, 5 Inch HD Display, 3600mAh, Quad-Core CPU, OTG, NFC (Orange) to your Shopping Cart. Head into the wild with the Huadoo HG06 fully rugged smartphone. Holding the IP68 certification this rugged Android phone is completely resistant against dust and water, allowing you to take the Huadoo HG06 where ever you’re headed without worrying about the wellbeing of your Android device. It’s fully rugged design makes this smartphone extremely durable and fully capable of dealing with the most extreme situations in life. No matter what you throw at it, this Chinese smartphone will take it like a pro. Holding two SIM card slots and featuring Dual-IMEI numbers this fully rugged smartphone lets you connect to two network providers simultaneously. 4G connectivity additionally provides you with the fastest network speeds out there, allowing you to browse the web and stay in touch with friends and family back home without encountering any interruptions. As the Huadoo HG06 features two IMEI numbers this Android phone provides you with the perfect platform to divide work and private life by using merely one device. Additionally, it allows you to insert two different mobile network providers, providing you with a wide range of network connectivity so that you can stay in touch with your loved ones no matter where in the world you’re headed. Running on an Android Operating system this Chinese smartphone lets you enjoy the latest features the mobile industry has to offer. Download millions of free Apps, games, movies, and more in the Google Play store and enjoy them on the phone’s 5 inch HD Display. With a quad-core CPU that has been clocked at 1.3GHz and 2GB of RAM the Huadoo HG06 is capable of handling the latest Apps, games and media without dropping a single frame. Additional features worth mentioning that this Android phone holds are OTG and NFC, both guaranteed to significantly increase your overall user experience. With its intergraded 13MP camera this rugged phone allows you to carry around a professional grade camera in your pocket at any time. The next time you head out into the wild and embark upon one of your magnificent outdoor adventures you can be assured that the Huadoo HG06 will help you capture all the stunning landscapes and remarkable moments in breathtaking quality. Capture and share all your unforgettable outdoor moments with friends and family – this 13MP camera lets you recall your memories in stunning quality after you have returned from your outdoor adventures. The Huadoo HG06 Rugged Smartphone comes with a 12 months warranty, brought to you by the leader in Android Smartphones as well as wholesale electronic gadgets..